Animal Friends: Animal Friends' Home-To-Home Adoption Program Presents... Rollins! Animal Friends' Home-To-Home Adoption Program Presents... Rollins! 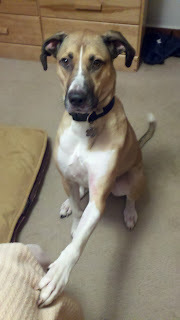 Rollins is a 4 year old male Great Dane mix. He weights 78 pounds but still thinks he is a lap dog! He has been a joy to our family for the past 4 years but with the birth of our child we can not give him the attention he deserves. 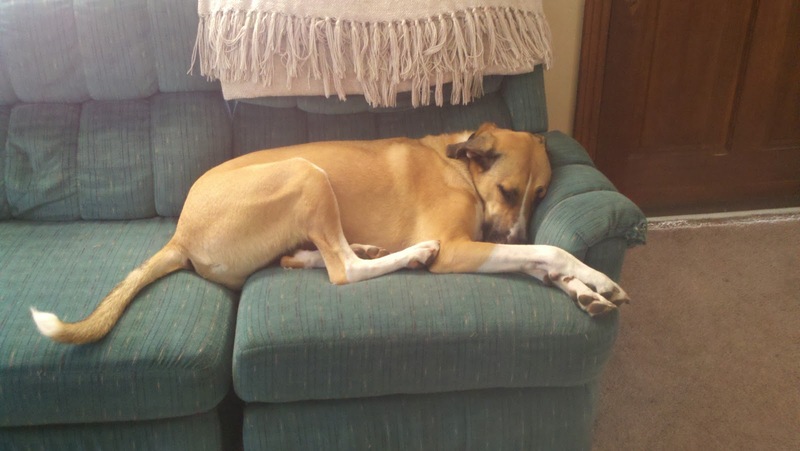 He is house trained and has been trained with the Gentle Leader. We have no inhibitions leaving him out in the house during the day when we are at work; we have never come home to damaged furniture nor has he gone to the bathroom in the house. It was very reassuring to find out how protective he is as demonstrated when someone tried to break into the house. He can be anxious around new people and other dogs but he is not aggressive. He is not appropriate for a family with children <14 years of age because he doesn't know how big and strong he is. Again, he is not aggressive but he likes to play a lot. Rollins loves and needs to go on walks. He has wonderful leash manners and therefore will not pull on the leash. He equally enjoys playing with toys and cuddling on the couch. If you give him a bone or Kong filled with peanut butter, he will easily occupy himself. He never begs at the dinner table and knows how to "sit, stay, lay down, and stand." He will wrestle and chase me when we play but he will stop immediately when told to. Even when we are playing, he is gentle and doesn't get overexcited. We are looking to find Rollins a home where he will be loved and given the attention he deserves. If you can help, please contact Rick Joreitz at 717-215-1403. Just happened upon your page. We have a dog that looks just like Rollins! ...ours is only one year old, though. I hope that this cute baby has found a great home! !